Interoperable technology designed by – and for – long-term care specialists. Geriatric Practice Management, Corp. (GPM) is a software solution and services company devoted to the support of long-term/post-acute care (LTPAC) medical practices. 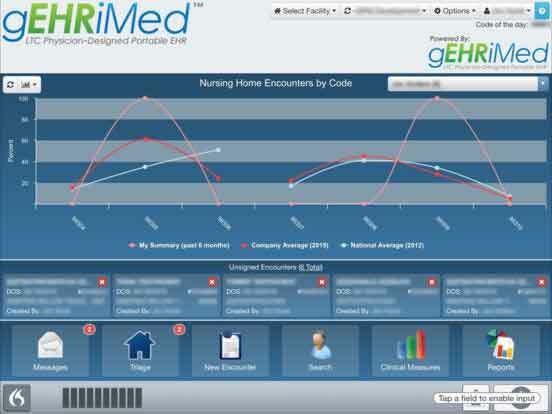 A focus on solving LTPAC’s unique problems has made us the market’s leading provider of medical EHR solutions, with the GEHRIMED EHR as our flagship product. We believe in the potential of powerful, intuitive technological solutions to make LTPAC practitioners’ jobs easier, more profitable, and more effective. Lasting change requires ongoing advancement. Our leadership’s 30+ years as practicing long-term care specialists has provided firsthand experience navigating the challenges practitioners and administrators face when striving to provide quality care to patients in the informationdense, closely regulated long-term care environment. In this rapidly evolving field, technology must stay ahead of the curve. Our regulatory staff meets frequently with our Clinical Advisory Team (CAT), a group of 5-10 current GEHRIMED users who provide input and feedback on our technology. As a result, GEHRIMED remains at the forefront of today’s LTC workflow, providing secure, interoperable technology for practitioners and administrators. Our mission is to continue to provide innovative, powerful and sophisticated technology solutions to meet the ever-changing demands of the long-term, post-acute care industry, with a focus on information security, inter-connectivity and interoperability.